Remember the bad-old days of business, when the Gordon Gekkos of the world ruled Wall Street with the mantra “greed is good”? In today’s post-Lehman Brothers society, say local executives, it’s looking a lot more like, well, good is good. Corporate social responsibility is becoming increasingly important to businesses across our region. In fact, experts believe that good corporate citizenship is no longer simply a gold star on a company’s reputation, but rather a necessity in today’s economic climate. Hargro has worked in philanthropy for more than 15 years; the Community Foundation serves as philanthropic adviser to individuals and companies, managing $4.4 million in donor funds. He says that, as local businesses emerge from the recession, they’re looking to combat the perception of the corporate world as uncaring and profit driven. That has led many companies to emphasize social responsibility just as much as turning a profit. According to Hargro, the benefits of such measures can be seen not only in the surrounding community, but also in a company’s own image, employee morale, value and competitive edge. So the question is: How can a company practically incorporate philanthropy into its business? 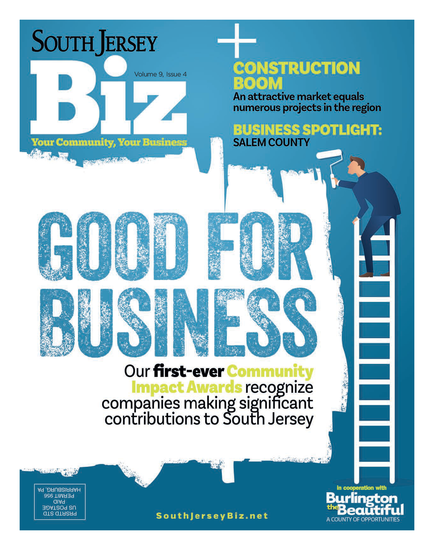 While the needs of the South Jersey community are numerous and varied, there are three main avenues through which local businesses can (and do) provide outreach. Those are: volunteerism, grant writing and community leadership. One leader on all three of those fronts is Campbell Soup Co. in Camden. 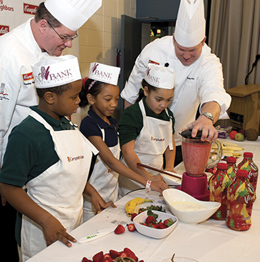 In addition to food donations, service events, matching gifts and millions of dollars in donations from the Campbell Soup Foundation, the company has designated employees to lead its philanthropic efforts. Among those efforts is a program to encourage volunteerism among Campbell’s employees. The Dollars for Does program allows workers to log their community service hours; once they reach a certain number with one organization, the company will make a monetary donation. Campbell Soup also illustrates the advantage of taking the lead on a single issue that clearly resonates with a company’s brand—in this case, children’s health in its home city of Camden. In February, Campbell announced a 10-year, $10 million plan to reduce childhood obesity and hunger among children in Camden by 50 percent. Campbell is partnering with several local programs to improve food access by building community gardens and ultimately bringing a second grocery store to the city of 78,000 residents. It’s also supporting the YMCA’s Catch program, and nutrition education for children, parents and pregnant women. Still, even if you don’t have $10 million in grants to give away, your company can make a difference simply by creating opportunities for employees to volunteer. Even those who lack substantial manpower can incorporate philanthropy into their business practice, simply by making it a priority. One example is Melvin Chilewich, a financial adviser and owner of Chilewich Financial Resources in Haddonfield. He serves as chairman of the board for the Genesis Economic Self Sufficiency Program, which helps Camden fathers coming out of incarceration to become reintegrated in society and ultimately reunited with their children in order to end a cycle of poverty and crime. With the help of the Genesis School of Business and pro bono legal assistance from Forkin McShane Manos and Rotz Family Law, he and the program have helped more than 100 men in just two years. “Of 105 put through the program already, 83 have jobs, six went back to college, a whole bunch got their GEDs,” Chilewich says. Chilewich says he sees his efforts as an investment in the local community: solving urban issues in turn strengthens the regional economy, which benefits everyone in business in South Jersey. He’s also building social capital that should bear long-term dividends. Whether large or small, Hargro encourages businesses to see that social responsibility has real value and is achievable. Published (and copyrighted) in South Jersey Biz, Volume 1, Issue 4 (April, 2011).